How Many Pitches Have We Got? 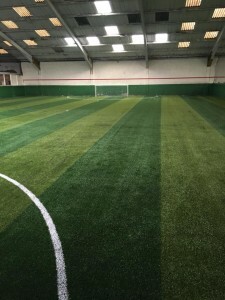 We are absolutely UNIQUE IN LEEDS, as we are the only venue with indoor floodlit 3G pitches. We are open from 10am every day untill 11pm. We have 3 indoor 5 a side pitches available for hire. We also have an online booking system – just select BOOK A PITCH and follow the easy to use instructions ! We have a BRAND NEW bar, with a viewing gallery, which is open every day for that well deserved post match pint! Or, if you are down watching your children play or be coached, we serve tea, coffees and soft drinks as well. We have 3 lagers, Fosters, Kronenberg & Amstel, from only £ 3.20 a pint, as well as bitter & cider on tap, plus many bottled offers! Do You Need a Private Meeting Room? Again, fully refurbished, it holds up to around 15 people, and its absolutely ideal for coaches training, a get together, or even business meetings. It is upstairs, completely private overlooking the pitches, and it can be set out classroom style or conference style to suit your needs. We all know that parking in Leeds can be a bit of a pain ! Well we have more than enough car parking spaces for everyone. You can park right outside Football World, so there are no long walks or busy roads to cross, and of course its free ! Use our simple online booking system to secure your football pitch now.